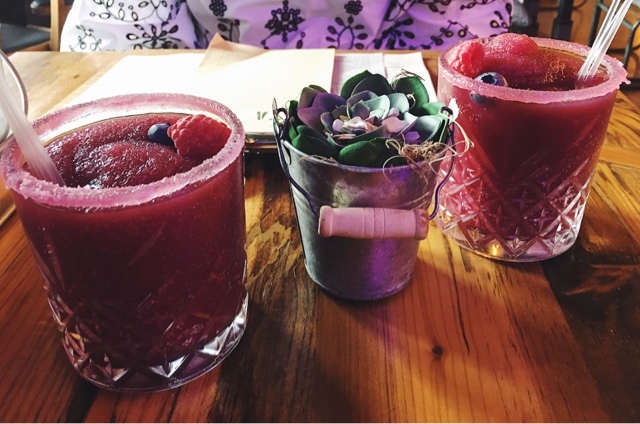 Considering how much of a priority food is in my life, food posts don't really feature on my blog all that much, however after a super delicious dinner in Mammacitas, I really couldn't not talk about it! I did the classic, went out for a nice dinner and ended up taking blog photos and internally planning a blog post in my head damn. It got me thinking about how many really great restaurants and independent places to eat there are near me, so I thought I would start a little mini series, exploring and giving my impressions of some of the newest and most loved places in town! For all the St. Andeans out there who, like me, have just returned to the town after their year abroad's or have just been living under a rock, Mammacitas is the new (and improved?) Grill House. 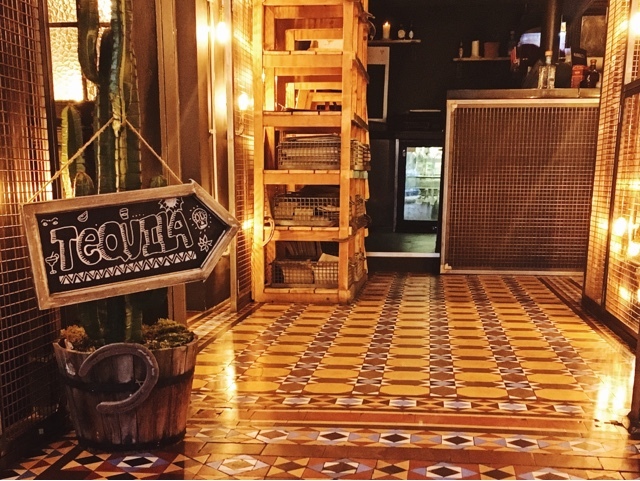 Styling themselves as a Mexican tapas and tequila bar I was really intrigued to pop in and have a look as there is nothing else like that in the town. I am not actually a massive fan of tequila, I don't even want to think about the last time I had it, but Mexican tapas? YES PLEASE! The interior is actually so cool and unique! The bar area is beautiful and there are some really interesting and fun looking plants and cacti dotted around the rooms. Aside from the main room that we were in, there are two further rooms and it even looks like they have an outside seating area which would be perfect on a sunny summer's day - if we ever get one! As it was a tapas restaurant, we decided to order a few dishes and just share them between the two of us. This was definitely the way to go as it meant we both got to try so many more things and it worked out as a pretty perfect amount of food! I always find it hard to gage with a tapas style restaurant how much food you are actually supposed to order, especially if you have never been before and have no idea on the portion sizes. I have read a few reviews since going and a few people have mentioned that the food comes out in a random order. To be honest, I really liked this style of being served! The food came out the kitchen as and when it was ready, and since it was tapas anyway it's not like you were getting your meal split up and served at different times. There wasn't a massive gap in when the dishes were brought out but it meant that we got each dish when it was hot and perfect for eating rather than they all sat on a counter going cold waiting for one last thing to be ready. 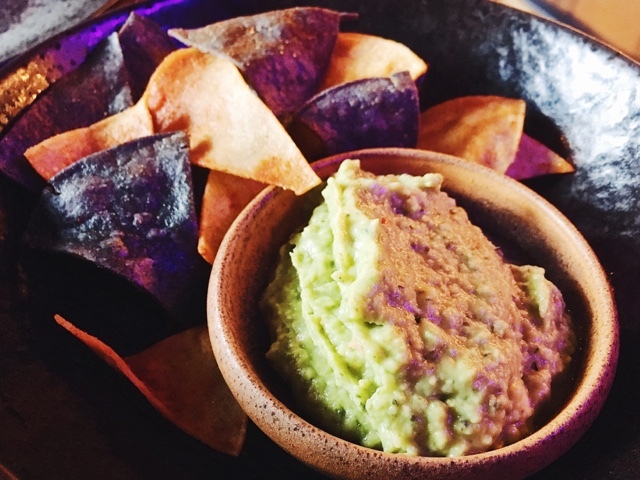 Guacamole Taquero; Slightly lighter and thinner than normal guacamole, this was served with fried tortilla chips. It was the perfect thing to nibble on whilst we waited on the rest of our dishes to be served and the portion of guac was very generous so it meant we had plenty to eat with all of the dishes. I did find it pretty strong on what I think was lime, which gave it a slightly different taste to the guac I am used to but it was delish! Pulled Pork Fries; For me, this was the highlight! 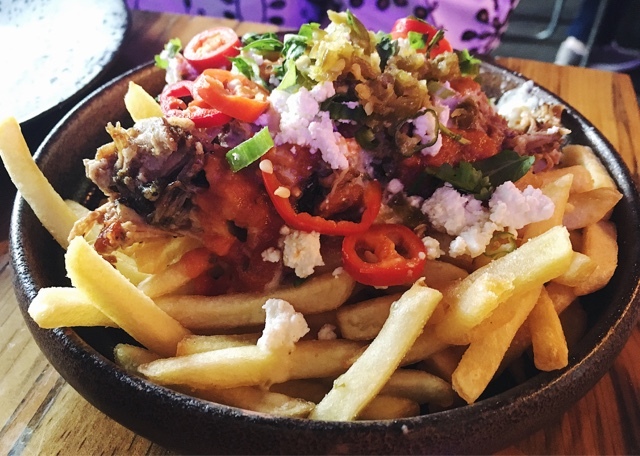 Crispy salty skinny fries, loaded with pulled pork, salsa, chille, jalapeños and feta it was absolutely dreamy! It was a special on the day we went so it isn't on the main menu which is such a shame because I would definitely order it if we went back. 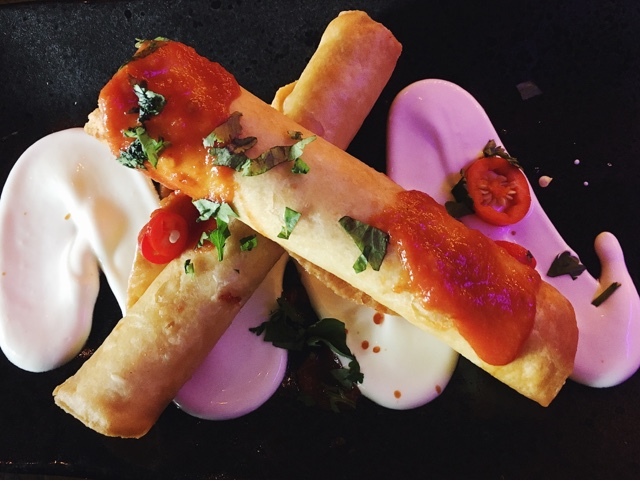 Smoked Chicken and Jalapeño Taquitos: These were interesting, really tasty but they definitely didn't have as much of a kick as the other dishes. Maybe because I had the bottom one and it didn't come with any of the spicy tomato sauce on it but I definitely didn't pick up on the jalapeño. The fried tortilla shell though was lovely and not too oily as I find they can sometimes be! 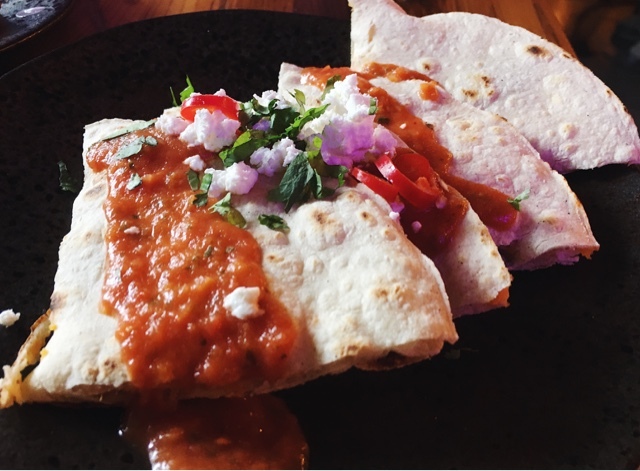 Sweet Potato, Feta and Salsa Raja Quesadillas: Another cheeky little tasty dish. The spicy tomato sauce and the strong taste of the feta worked amazingly with the sweet potato filling. These are definitely eat with your finger food though as they were so difficult to cut with a knife and fork. Would definitely order these again! Churros with Chocolate Sauce: Another from the specials board (Although my friend had this last time she was there as well so luckily it sounds like a bit of a regular!) but holy moly these were heavenly!! I am a massive churros gal, and I have to say these were some of the best I've ever had! They were small, yes, but after eating all the food before it was the perfect amount! 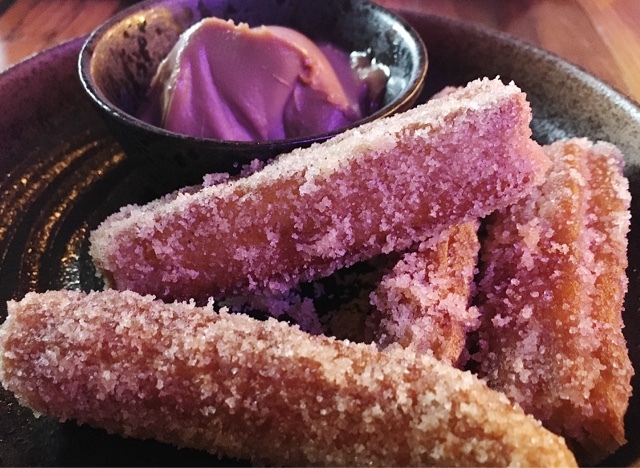 I don't normally go for deserts as I am way more of a savoury than a sweet, but the churros are definitely one not to miss! The chocolate sauce was like a mixture between ice cream and a sauce, it was slightly cold which actually worked really well with the warm churros. Mmmmmm. That being said, the whole thing came to just under £20 which wasn't too bad considering how many different tasty dishes we got to try. Our servers were all lovely, however I would have liked it if the menu explained what some of the dishes were a little more as we did have to ask a lot of questions. 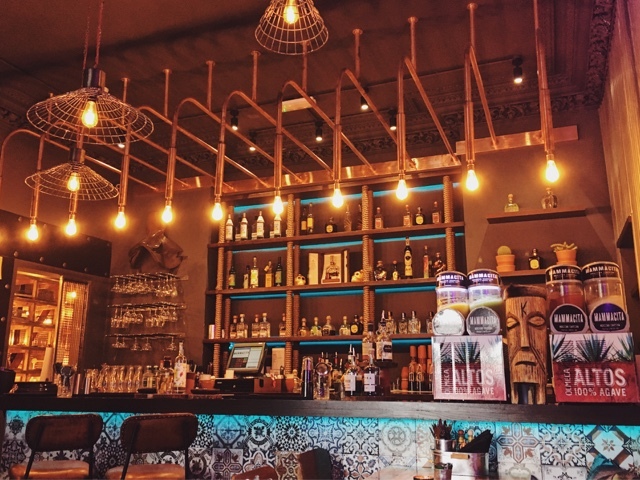 I will definitely be going back, a mixture of good and interesting food, cool interior, oh and excellent music (they played Despacito which made me lol) it definitely stand out in the town as a unique place to eat! wow wow wow! i am salivating just looking at this post! what fantastic value for money, and those drinks looks incredible. i'm adding this to my bucket list! Such beautiful pictures. And the writing. Kudos. Loved reading.